Waterloo – Today, RBC announced, as part of their Future Launch program, a donation of $450,000 to Wilfrid Laurier University to create and support innovative new entrepreneurship programming. The RBC Ambassador Program, the RBC Entrepreneurial Experience Program and the RBC Entrepreneurial Accelerator Program will be administered through the Schlegel Centre for Entrepreneurship & Social Innovation at Laurier’s Lazaridis School of Business & Economics and available to students in all faculties and across all campuses. Through the RBC Ambassador Program, RBC staff will offer events and workshops at Laurier, and provide individual and group mentorship to student entrepreneurs. The RBC Entrepreneurial Experience Program will provide grants to students so that they can attend entrepreneurial events, conferences and competitions. The RBC Entrepreneurial Accelerator Program will support five high-achieving student entrepreneurs per semester over three years (for a total of 45 students). Students will receive a stipend to work full-time for a four-month work term, dedicating their efforts to accelerating progress on their entrepreneurial venture, or to supplement their salary to work in a startup where they can learn the specific skills required to be an entrepreneur and run a startup. RBC and Laurier have enjoyed 34 years of partnership supporting students. 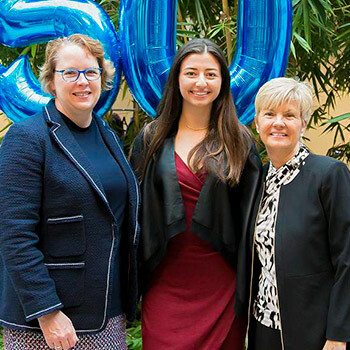 To date, RBC has given over $1.3 million to Laurier, supporting initiatives such as the RBC Career Transition Program for Students with Disabilities, the Brantford Campus Capital Campaign and many event sponsorships. RBC has hired 276 co-op students from Laurier and currently employs almost 300 alumni. A special “Build your Personal Brand” workshop for Laurier students took place at the Paul Martin Centre at Laurier’s Waterloo campus immediately preceding the gift announcement. The workshop was presented by Griffith Dias, recruiter, early talent acquisition and Jovic Howland, senior recruiter, early talent acquisition for RBC in collaboration with the Schlegel Centre. During the workshop, students learned about building an authentic and unique personal brand and gleaned tangible tips and advice on how to tell their story and build a brand that is distinctly theirs. After the workshop, students mingled and networked at the gift announcement, where everyone had the opportunity to explore RBC’s new career development tool, RBC UpSkill. With a vision to be among the world’s most trusted and successful financial institutions, RBC is one of Canada's biggest banks, and one of the largest in the world based on market capitalization. RBC is one of North America's leading diversified financial services companies, and provide personal and commercial banking, wealth management, insurance, investor services and capital markets products and services on a global basis. Over 81,000+ full- and part-time employees serve 16 million clients in Canada, the U.S. and 34 other countries, with the mission to help clients thrive and communities prosper.